1:14 a.m.- Dustin Pedroia pummels a pitch from Rays pitcher Brandon Gomes. Rays centerfield B.J. Upton runs it down. How many hard-hit balls that look like they will land 10 rows into the bleachers will be caught tonight? 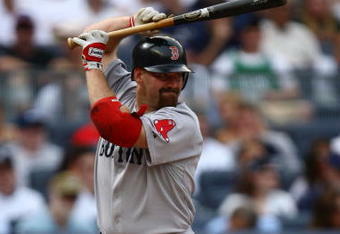 1:16 a.m.- Kevin Youkilis gets hit for the 4,982nd time this season. Actually, ESPN play-by-play guy Dan Schulman informs me it is the 12th time this season Youkilis has been hit. I was just a little off in my estimation. 1:17 a.m.- Drew Sutton steps up the plate. It really seemed like a good idea to have Sutton pinch-run for David Ortiz with the bases loaded and no one out in the top of the 11th. Not so much right now. 1:20 a.m.- ESPN flashes to the Red Sox dugout with Big Papi leading a clan of players wearing rally caps. I have to say I love the look. Maybe this will be the Red Sox’s new thing, like the bullpen band, which started in 2007. 1:21 a.m.- Darnell McDonald pops up to end the top of the 15th. Still 0-0. I go grab a box of “Quattro Formaggio” Triscuits. Always a great snack. 1:23 a.m.- Alfredo Aceves begins his third inning of work tonight for Boston. Have to say he’s been a great pickup this offseason by Red Sox General Manager Theo Epstein. The versatile pitcher has started, filled the long-relief role and helped set-up for closer Jonathan Papelbon. 1:24 a.m.- The Red Sox have left 15 men on-base. Ugh. 1:27 a.m.- All this time staring at the Rays’ light blue alternate jersey has made me realize just how ugly it really is. Has to be one of the worst jerseys in sports. 1:28 a.m.- Aceves hits Evan Longoria and Casey Kotchman in consecutive at-bats. One out. B.J. Upton coming up. I am a little nervous. 1:29 a.m.- Schulman informs the audience that this is the longest game in Rays history. All 14 years of it. 1:31 a.m.- Aceves gets Upton to pop up and Justin Ruggiano to ground out to end the 15th inning. What a great job by Jason Varitek. The 39-year old catcher has caught all 15 innings tonight. Unbelievable. 1:34 a.m.- No errors in this game so far. Only two major league games ended with completely clean and errorless baseball today. 1:35 a.m.- The Rays bring in their final pitcher in the bullpen, Adam Russell. They have just one more player available on their bench, Elliot Johnson, who is a second baseman with a total of 19 at-bats this year. I’m really hoping we see him pitch. That would make this game even more enjoyable. 1:37 a.m.- Josh Reddick draws a leadoff walk. The Red Sox still haven’t had a hit since Dustin Pedroia’s double in the ninth. The Rays’ bullpen has walked 10(!) Red Sox hitters. The bats need to come through at some point. 1:38 a.m.- Varitek lays down a perfect bunt to put Reddick in scoring position. I’m not normally a big fan of the bunt, but in this situation, I like the call. 1:39 a.m.- Marco Scutaro walks up to the plate. I have noticed that he has switched bats from earlier in the game. He is now using a black bat instead of the basic, no-paint bat. Maybe this is the lucky bat that will deliver the elusive hit! 1:39 a.m.- The bat does have some luck in it! Scutaro hits a weak groundball up the middle, but Rays shortstop Reid Brignac botches it. Runners on the corners, one out! Jacoby Ellsbury coming up. Why did Scutaro wait until the 16th inning to use his lucky bat? 1:41 a.m.- What does he do? Ellsbury hits a shallow flyball that is not deep enough to score Reddick from third. ARE YOU KIDDING ME? COME ON! 1:41 a.m.- Starting to think that this game might actually never end. Dustin Pedroia steps up to the plate. 1:42 a.m.- AND PEDROIA DELIVERS!!!! WHO ELSE? The Red Sox take a 1-0 lead! Why did I ever doubt him? 1:43 a.m.- Pedroia is one of my all-time favorite players. I absolutely love the guy. The smallest player on the field always seems to deliver in the game’s biggest moments. He has three of the Red Sox’s five hits tonight, going 3-for-7. The rest of the team is 2-for-45. 1:44 a.m.- Adrian Gonzalez swats a flyball to deep right field… Could it be? Not today, it falls just short. Make that 2-for-46. Nice leaping catch by Ben Zobrist to keep this game within reach for Tampa Bay. Jonathan Papelbon time! 1:45 a.m.- Commercial break. I run the Triscuits back to the cabinet in the kitchen. They were delicious. 1:46 a.m.- Surprised to see Papelbon’s ERA in the 4’s. The more I think about it, with the way Daniel Bard is pitching, the more I think this is Papelbon’s last year in Boston. 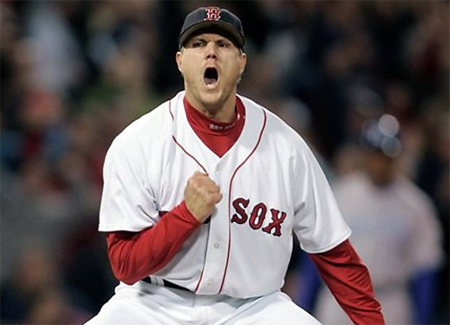 1:50 a.m.- Papelbon strike out Sean Rodriguez and gets Kelly Shoppach to ground out to Youkilis at third. The crowd screams, “YOOOOOOOUUUUUUUKKKKKK.” Gotta love the great home-field advantage for the Rays at Tropicana Field. 1:51 a.m.- One more out! 1:52 a.m.- Two strikes on Brignac! Put him away, Papelbon! 1:53 a.m.- Nine pitches for Papelbon. Nine strikes. He looks like a man on a mission to get out of Tampa Bay as soon as possible tonight. 1:54 a.m.- Brignac rips a pitch headed towards right field. Adrian Gonzalez makes a nice snag before throwing it over to Papelbon covering first base and the ballgame is over! Papelbon delivers his signature fist-pump. One of my favorite fist-pumps in sports. It’s the same exact one every time but it’s filled with so much emotion. 1:55 a.m.- It took five hours and 55 minutes, but what a game! 1:55 a.m.- It’s games like this that reinforce why this is the best sport on the planet. The two teams averaged one hit every 53 minutes. The Red Sox left 17 runners on base. The Rays used each of their eight relievers and had two coaches ejected. It was the third-longest scoreless game in Major League Baseball history. 2:00 a.m.- Every time you watch a baseball game, you see something you have never seen before. This one had a lot of new twists in it and became one of the most entertaining games I have ever watched. I love baseball. 2:25 a.m.- I am finished editing my article so that it (hopefully) makes sense. I am going to sleep but I cannot get over how great of game that was! Goodnight! This entry was posted on July 18, 2011 by Scott Kornberg. It was filed under Boston Red Sox, Tampa Bay Rays and was tagged with Adam Russell, adrian gonzalez, Alfredo Aceves, B.J. Upton, Ben Zobrist, Big Papi, BJ Upton, Boston Red Sox, Brandon Gomes, Casey Kotchman, Dan Schulman, Daniel Bard, David Ortiz, Dustin Pedroia, ESPN, Evan Longoria, Jacoby Ellsbury, Jason Varitek, Jonathan Papelbon, Josh Reddick, Justin Ruggiano, Kelly Shoppach, Kevin Youkilis, Reid Brignac, Scott Kornberg, Sean Rodriguez, Tampa Bay Rays, Triscuit.